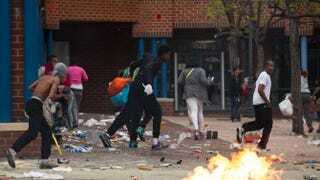 People carrying goods leave a CVS pharmacy near the intersection of Pennsylvania and North avenues April 27, 2015, in Baltimore. Among the more annoying habits of a society appalled by social unrest is its casual dis of the poverty that causes it. Discussing, dissecting and debating police violence and the angry reaction to it (now a weekly exercise) is the easy part. But the harder conversation means grappling with the devil in the socioeconomic details. One could even make the argument that, as a nation, we subconsciously prefer the endless Twitter-incubated scrap over police brutality because it keeps us conveniently removed from a much more critical examination of the tragic conditions people live in. Anything but that, right? And yet Baltimore’s official 8.4 percent unemployment rate (pdf)—almost double the national average—still stands, at least according to the federal government’s Bureau of Labor Statistics. Deeper analysis suggests that it’s worse than the feds let on, with less than 58 percent of working-age black men between the ages of 16 and 64 being employed, according to a 2012 University of Wisconsin-Milwaukee multicity study (pdf)—compared with over 78 percent for their white counterparts and down from 73 percent in 1970. For black youths in Baltimore, the unemployment rate is 16.1 percent, 2 percentage points higher than the average national youth-unemployment rate and almost triple the overall national jobless rate. It’s not just Baltimore, either. Still, politicians can cut up all they want on “thugs” as a way to appease powerful law-enforcement lobbies and panicky white voters. Or pacifying commentators can go to whatever length they think is necessary to placate ignoramus colleagues and friends who can’t understand why “black people keep burning up their neighborhoods.” Meanwhile, the majority of whites—70 percent of whom (pdf) consider racial discrimination in their local communities a nonproblem—can continue sticking their collective heads in the sand. Despite all that, the pissy stench of poverty and hopelessness remains. The growing gulf of haves and have-nots is there, many gladly ignoring it while holed up in middle-class comfort zones. In the case of Baltimore, how can you miss it, and how can you not want to talk about it? It’s Maryland’s largest city, accounting for 10 percent of the crab state’s population. But Baltimore also stands as a blemished statement on Maryland’s growing quality-of-life divides: 64 percent black, and a total citywide poverty rate above 25 percent (compared with the national rate of 15 percent and a state rate of 10 percent). The city’s black poverty rate is just under 24 percent, much higher than the state’s black poverty rate of 14 percent. He’s right. It’s definitely not new in Charm City, where poverty is just as prevalent today as it was in 1970—even more so in certain areas, according to a recent City Observatory report. Poverty in certain tracts of Baltimore has actually risen, with 55 areas considered “high-poverty.” Areas near locations such as the famed football and baseball stadiums are experiencing poverty rates as high as 35 percent, up from 32 percent in 1970. West Baltimore’s Rosemont hood saw a massive spike in poverty over the past 40 years, from 15 percent in 1970 to 42 percent in 2010. City homeownership rates also reflect this. Maryland might boast a homeownership rate near 68 percent, but Baltimore’s is just 48 percent (it has the ninth-highest rate of foreclosures in the nation). And while wealthy Washington, D.C., suburbs only 25 minutes or so away from Baltimore raise the state’s median household income to nearly $74,000, in the city it’s just an average $41,000. Any random drive through Baltimore pre-Freddie Gray clearly offered clues of a lit match halfway near the gas puddle. Places such as West Baltimore’s Sandtown neighborhood, where Gray lived, are tinderboxes full of folks who have nothing to lose. Urban professional gentrification displaces the poor while city leaders dress the Inner Harbor downtown with lavish venues after spending money they could never find for the people who needed it most. Baltimore’s poverty didn’t suddenly occur unnoticed or in a vacuum. Active suppression of a necessary tale-of-two-cities debate, because we’re afraid that it gives looters a pass, dooms us to perpetual failure. We can’t continue driving past and then fake confusion every time unrest occurs, especially when it has stared us down for this long. The solution must be a two-way street: We can’t expect civic control in economically traumatized areas if we’re not willing to offer a bit of civic consideration.